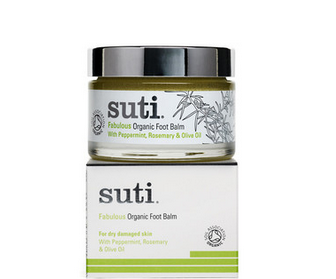 Let me introduce you to Suti a luxurious holistic skincare range. Suti products are organic, chemical free and not tested on animals so when they offered me the chance to review some products I jumped at it. I would like to share with you the company background as I found it rather interesting. Suti is relatively new, founded in 2010 by Suzannah Jenkins and Tina Steadman. Their collaboration came from a mutual desire to use natural products. Suzannah is a qualified homeopath, aromatherapist and complementary medicine practitioner. She set up a practise from home and created tailored products for clients following on from that Suti skincare was born. There are seven products in the range Rejuvenate Face Oil, Nourish Face Oil (for night), Facial Cleanser, Rose Water Toner, Peppermint Water Toner, Purity Moisturising Balm and Fabulous Foot Balm. As I mentioned Suti very kindly agreed to send me a couple of products. I requested that I was interested in the foot balm and cleanser. In this post I will review the foot balm as I wish to do a separate review for the cleanser. I am not ashamed to admit that I pamper the rest of my body with lotions but neglect my tooties. I generally am not a fan of my feet I suffer from extremely dry skin. When I read the product description I realised my feet were crying out for this product. The balm is very luxurious and melts into oil with the warmth of your skin. I am not a fan of overpowering peppermint foot creams, however, this has a gentle hint of peppermint combined with rosemary, it is very pleasant. This balm contains some other fabulous ingredients like olive oil, avocado, carrot, calendula and pumpkin seed. I prefer to use a foot cream just before I go to bed. I tend not to remember to apply every night but I aim for at least every other day. With this product a little goes a long way, you do not need much I have been using a 5p/10p size of the balm. I am really impressed with the results gradually over the past two/three weeks the condition of my skin has improved. My cracked heels are looking smooth and nourished. When applying a foot cream I am always conscious of irritation on my hands but I have not have any problems with this product. The Foot Balm sounds like something I should try!